UK clubland cracks America. 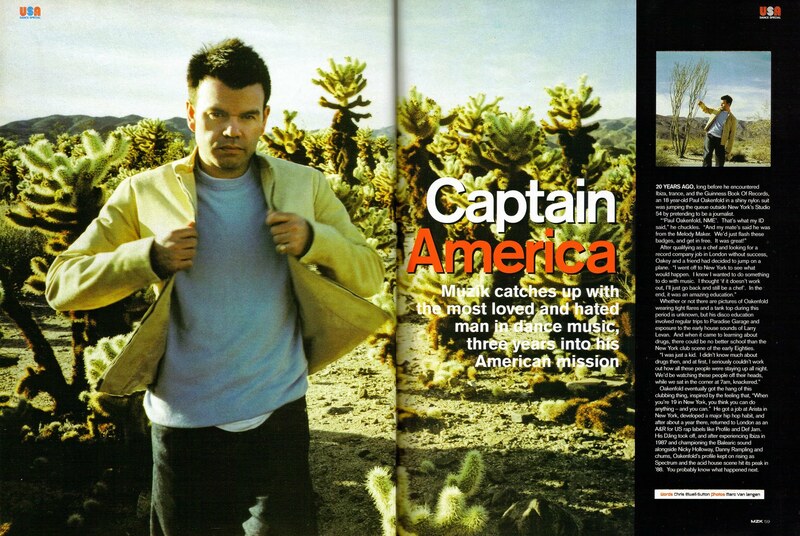 . .
20 YEARS AGO, long before he encountered Ibiza, trance, and the Guinness Book Of Records, an 18 year-old Paul Oakenfold in a shiny nylon suit was jumping the queue outside New York’s Studio 54 by pretending to be a journalist. Whether or not there are pictures of Oakenfold wearing tight flares and a tank top during this period is unknown, but his disco education involved regular trips to Paradise Garage and exposure to the early house sounds of Larry Levan. And when it came to learning about drugs, there could be no better school than the New York club scene of the early Eighties. Oakenfold eventually got the hang of this clubbing thing, inspired by the feeling that, “When you’re 19 in New York, you think you can do anything – and you can.” He got a job at Arista in New York, developed a major hip hop habit, and after about a year there, returned to London as an A&R for US rap labels like Profile and Def Jam. 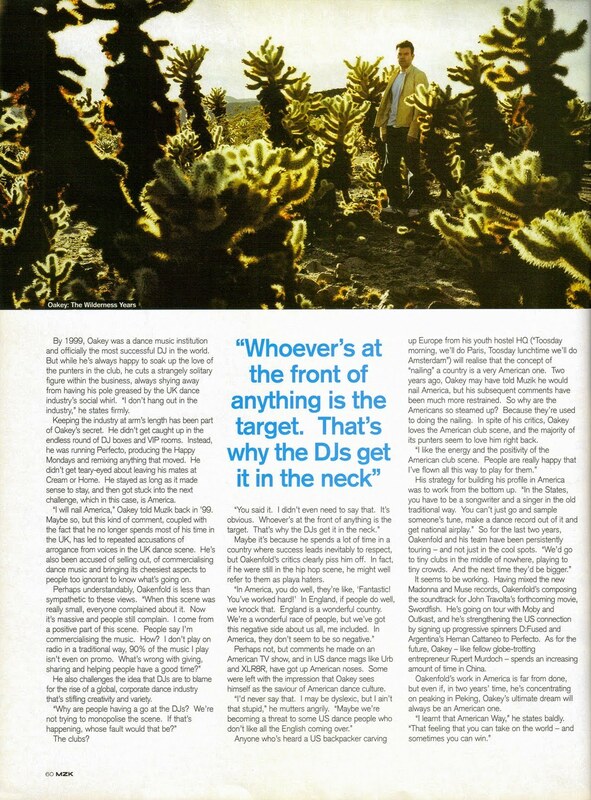 His DJing took off, and after experiencing Ibiza in 1987 and championing the Balearic sound alongside Nicky Holloway, Danny Rampling and chums, Oakenfold’s profile kept on rising as Spectrum and the acid house scene hit its peak in ’88. You probably know what happened next. 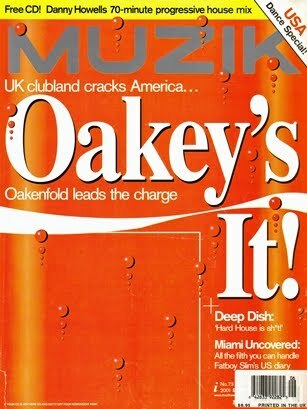 By 1999, Oakey was a dance music institution and officially the most successful DJ in the world. But while he’s always happy to soak up the love of the punters in the club, he cuts a strangely solitary figure within the business, always shying away from having his pole greased by the UK dance industry’s social whirl. “I don’t hang out in the industry,” he states firmly. Keeping the industry at arm’s length has been part of Oakey’s secret. He didn’t get caught up in the endless round of DJ boxes and VIP rooms. Instead, he was running Perfecto, producing the Happy Mondays and remixing anything that moved. He didn’t get teary-eyed about leaving his mates at Cream or Home. He stayed as long as it made sense to stay, and then got stuck into the next challenge, which in this case, is America. “I will nail America,” Oakey told Muzik back in ’99. Maybe so, but this kind of comment, coupled with the fact that he no longer spends most of his time in the UK, has led to repeated accusations of arrogance from voices in the UK dance scene. He’s also been accused of selling out, of commercialising dance music and bringing its cheesiest aspects to people too ignorant to know what’s going on. He also challenges the idea that DJs are to blame for the rise of a global, corporate dance industry that’s stifling creativity and variety. Maybe it’s because he spends a lot of time in a country where success leads inevitably to respect, but Oakenfold’s critics clearly piss him off. In fact, if he were still in the hip hop scene, he might well refer to them as playa haters. Perhaps not, but comments he made on an American TV show, and in US dance mags like Urb and XLR8R, have got up American noses. Some were left with the impression that Oakey sees himself as the saviour of American dance culture. Anyone who’s heard a US backpacker carving up Europe from his youth hostel HQ (“Toosday morning, we’ll do Paris, Toosday lunchtime we’ll do Amsterdam”) will realise that the concept of “nailing” a country is a very American one. 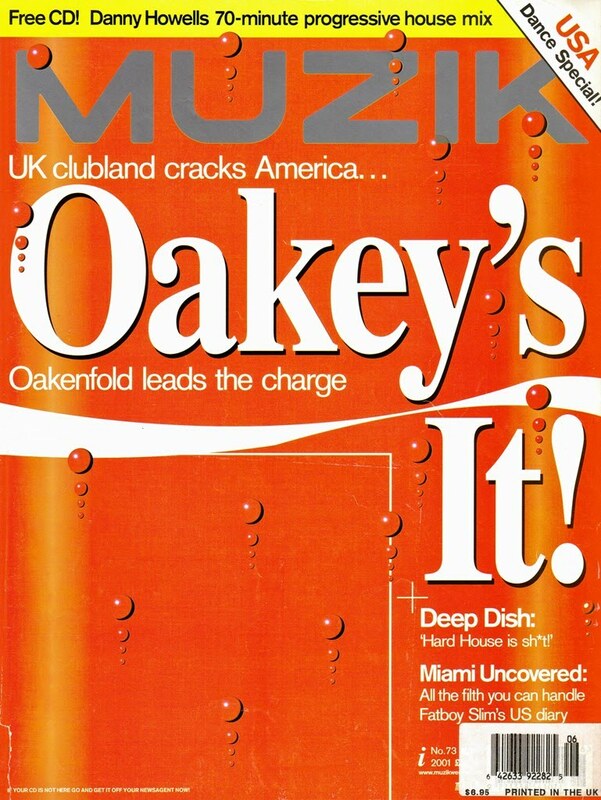 Two years ago, Oakey may have told Muzik he would nail America, but his subsequent comments have been much more restrained. So why are the Americans so steamed up? Because they’re used to doing the nailing. In spite of his critics, Oakey loves the American club scene, and the majority of its punters seem to love him right back. It seems to be working. Having mixed the new Madonna and Muse records, Oakenfold’s composing the soundtrack for John Travolta’s forthcoming movie, Swordfish. He’s going on tour with Moby and Outkast, and he’s strengthening the US connection by signing up progressive spinners D:Fused and Argentina’s Hernan Cattaneo to Perfecto. As for the future, Oakey – like fellow globe-trotting entrepreneur Rupert Murdoch – spends an increasing amount of time in China. Oakenfold’s work in America is far from done, but even if, in two years’ time, he’s concentrating on peaking in Peking, Oakey’s ultimate dream will always be an American one.